Converse with a chimpanzee about habitat problems, or discuss overfishing with a whale. These are just two possible encounters in EcoScope, part of the Eco-Media exhibition in Germany (October 2007- January 2008). Produced by the international art collective Transnational Temps, this online forum also offers tools for sending quirky postcards to friends, either electronically or through your printer. You’re invited to come join the conversation. There’s content in EcoScope before you arrive, but half the fun is what you bring to it. Peer into the EcoScope! 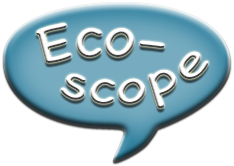 EcoScope is a telematic forum concerning environmental issues. It is one of a series of projects by the international art collective Transnational Temps involving the environment, public participation, and tactical media. It stands to reason that solutions to the various contemporary ecological challenges are more likely to emerge when the public is both well informed and practiced in articulating ideas about the environment. 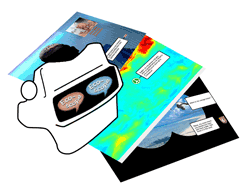 So EcoScope is designed to combine information with discussion. Its structure indicates the importance of participation in any meaningful solutions that can be imagined. Although EcoScope resembles some existing graphical chat software, what separates it from others is the context it provides. EcoScope leverages scientific visualization, time-lapse satellite photography, landscape photography, and environmental journalism to provide a framework for conversation and discovery. Since its formation in 2001, Transnational Temps has developed diverse media art relating to the environment, extinction, public awareness, and the limits of technological progress. Members of Transnational Temps are artists without borders, culture workers dedicated to imagining new maps and finding alternative routes to the future.